Earlier last week the Supreme Court decided to partially revive the “travel ban” with one slight exception to the previous bill – individuals with “bona fide” ties to the U.S. are allowed to enter. The Supreme Court justices stated that the government could not apply this ban to people who already had well-established connections to the United States. These “connections” include employment, university admission and invitations to lecture at a College or University. Obviously this has left thousands of immigrant groups in a flurry over who can bypass the restrictions and who will be permanently barred from entering the United States. 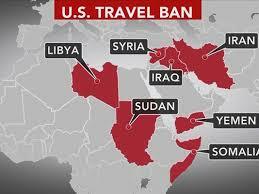 The ban will cover the following countries: Iran, Libya, Somalia, Sudan, Syria, and Yemen. Further, refugees from any country in the world are prevented from entering the United States for 4 months. The departments of State and Homeland Security issued a statement announcing that people with green cards and visas that were valid before the ban went into effect won’t be affected, and that individuals granted asylum. One of the main issues that the Trump Administration is now facing is detailing what circumstances fall under the exception announced in the travel ban. For instance, spouses (and fiancés), parents, in-laws and siblings all fall under the “close” umbrella, whereas grandparents and other family members are not. The Department of State has said refugees who arrive in the country through July 6 will be admitted whether they can claim a connection to the U.S. or not. The department expects a 50,000 cap on refugees to be reached for the fiscal year, which ends in October. Data from 2015 shows that there were 49,412 tourist and business visits to the U.S. by the citizens of the six countries from the travel ban. Employment and student visas that year accounted for 13,000 visits. Further, Green cards were given to 31,258 people from the nations. If you have any questions about the newly issued travel ban and if you are affected by it, or any other immigration related questions, please feel free to call Buda Law Group any time.